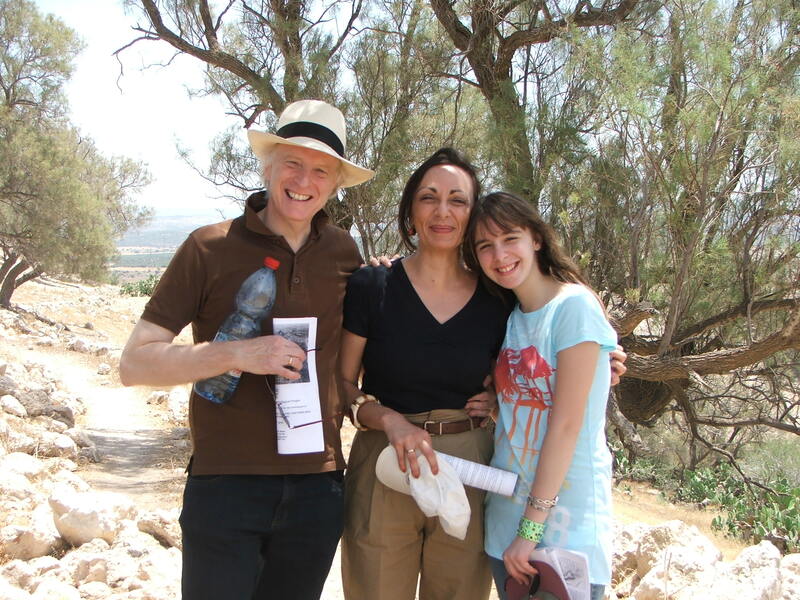 Today, I had the pleasure to give an extended tour of the site to Prof. Joseph Maran, his wife Prof. Eftychia Stavrianopoulou, and their daughter Penelope. Prof. Maran is the excavator of Tiryns, the important Mycenaean site in the Argolid. Needless to say, the input that they had on and about the site was very interesting and enlightening. While walking the site, I noticed an interesting worked stone. While it would be hard to determine this in light of its being a surface find, in a very mixed area (with modern and ancient masonry and other finds strewn on the surface), the shape of this stone did remind me of stone altars known from various ancient near eastern sites. On the other hand, it might simply be a stone that is related to the processing of some type of fluid (such as oil, wine, etc.). We will definitely have to check this out in the future! Here is a picture this unusual stone. 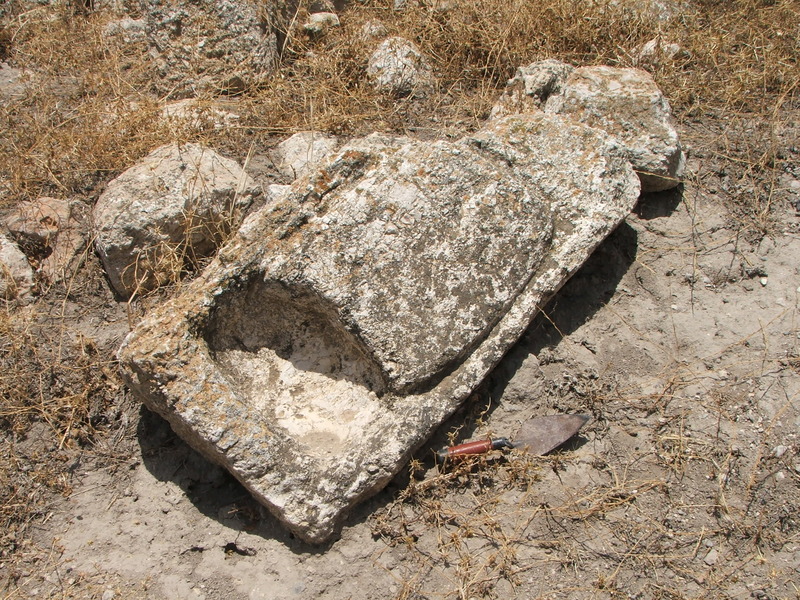 UPDATE: Amit Dagan, longtime staff member of the excavation (and who knows a LOT about many things) saw the picture of this stone and has provided a simple explanation to this. 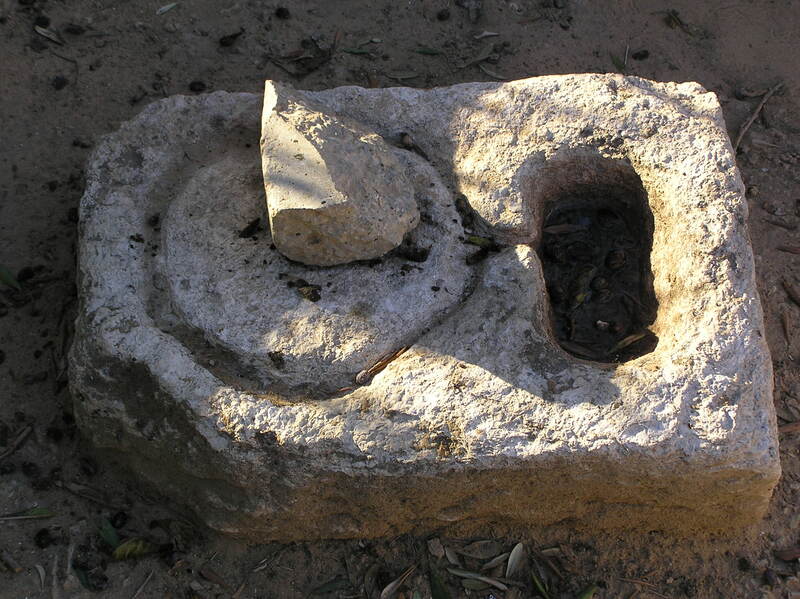 It is apparently a small, household, olive press, typical of the Roman-Byzantine period, and is even referred to in the Mishnah as a “Bodeidah” (small press) in M Sheviit 8:6. Amit has also provided a picture of a complete example, from which the function as a press is quite clear. Way to go Amit!!! Does the stone know you? There’s a similar press, but without the hole in the monumental building at Maroni.